This is the time of year, especially with the recent dipping temperatures, that we start thinking about all that there is to do around the house and in the gardens to prepare for the long winter ahead of us. There are two schools of thought when it comes to dealing with the garden in the late fall. On one side are the folks who prefer to let things be and to deal with it all in the spring. They like the look of Ornamental grasses billowing in the winter wind or the way that the birds are attracted to the black seed heads of Rudbeckia. On the other side of the spectrum are the folks that like their gardens looking neat and tidy for the winter. This is the more popular trend and certainly has its benefits, such as less winter die back, less pests/disease return or damage due to animals and salt. Here are a few tips for putting your gardens to bed for the winter. Of course if you are not up for the task we would be more than happy to help you out, just let us know! Cut back perennial foliage. This practice should be completed after the first few killing frosts. You should cut back the foliage and stems to a height no less than 3-4” above the crown of the plant. Compost all removed foliage, unless the plant was diseased in some way. If that is the case then burn or throw-out the removed diseased foliage. Th practice of cutting back perennials also helps to cut down on pest/insect problems as many slugs, snails and insects often lay eggs in the decaying foliage. Once the foliage is removed you can easily divide the plant if that was deemed necessary during the growing season. As you will now be able to see the crown and structure of the plant this task will be easier. When dividing perennials you should remove any/all damaged or diseased roots from the plant. And when replanting make sure to give the newly divided portions plenty of room to grow and expand. Less cold hardy or sensitive perennials should be protected in the garden. This is especially important in areas that may not have heavy snow cover. You can protect these by mounding mulch or leaves around the crown of the plant. Deciduous shrubs can be deadheaded going into the winter. This means removing/ pruning off spent blooms and disposing of them properly. By removing them you limit the chance of the shrub’s seeds spreading throughout your garden. Both traditional needled evergreens and Broadleaf evergreens such as Boxwood and Rhododendrons can easily dry out and be damaged by the harsh winter wind. This can be prevented in two ways. The first is to apply an Anti-dessicant ( anti-drying agent). This is essentially a waxy coating that is sprayed directly on the leaves. This helps to keep the leaves/needles from drying out and needs to be sprayed on the leaves in the late fall before freezing temperatures settle in. The second option for protecting these shrubs is to wrap them in burlap. You can either wrap the plant directly and tie with twine or place stakes around the shrub and staple the burlap around the stakes. Either way this method works well to keep the harsh wither wind from damaging the shrubs, while still letting moisture/rain in. Plastic should never be used for this application, as it will act as a greenhouse keeping the shrub warm, in some cases preventing them from going dormant and can lead to rot as moisture is kept contained around the plant. Watch this tutorial video from This Old House if you want more information. Salt can also be an issue for shrubs along roads, driveways and sidewalks. 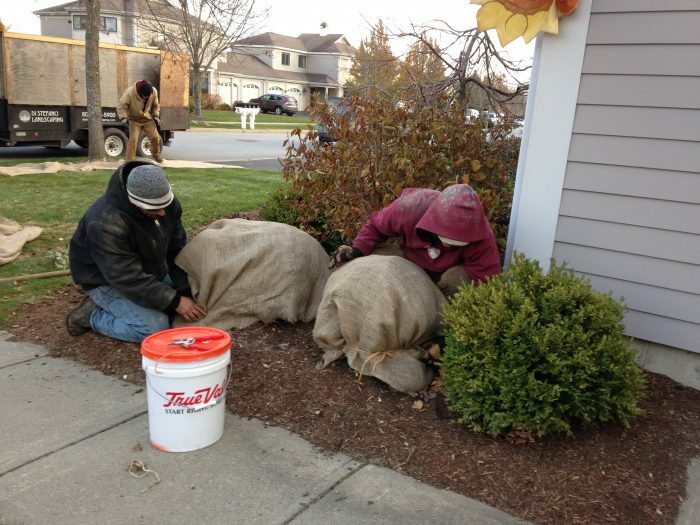 Some damage can be prevented with the use of burlap in the same manner as wind prevention. If there is a chance of heavy snow loads from roofs damaging plant material, snow frames/A-frames should be constructed over them. They can be purchased or simply constructed out of wood. If the shrub is marginally hardy or you feel like it needs a little more protection due to the lack of snow cover, the base of the shrub can be mounded with mulch or leaves to protect the roots. This practice is commonly used for Roses. Animals such as deer and rodents can be a major problem and cause a lot of damage to the garden during the winter. This is tough time of year for these guys as there is less for them to eat/forage. Damage can be decreased by putting up deer fencing or burlap out a distance from the shrubs you are trying to protect. Hardware cloth/screen can be place around the base/trunk of shrubs and small trees to prevent rabbits and mice from munching. If neither of these options seem to work, then you should try repellent that can sprayed on the plant. You may need to repeat this application several times throughout the winter. Our crew attended the annual Industry Awards for the Home Builders and Remodelers Association of Northern Vermont, last Thursday November 6th . It turned out to be a great night. We not only won the Best Landscaping award, but we also won the People’s Choice award. 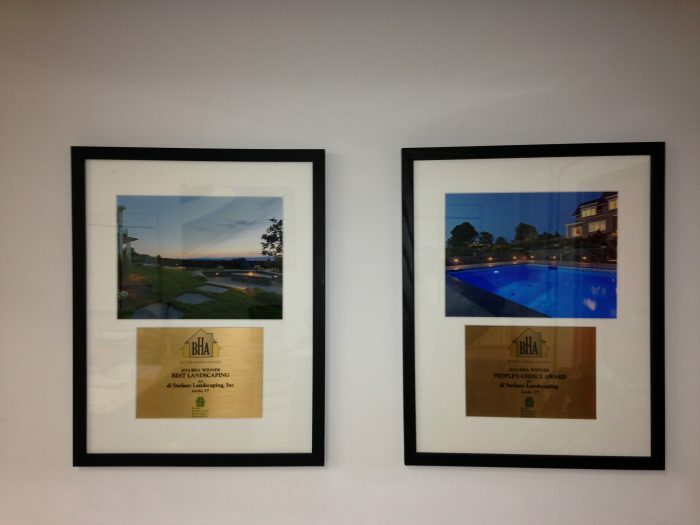 Which was chosen from projects across a broad spectrum of categories. We want to thank you all for the votes and support! Check out our facebook page for more recent project and news from us!